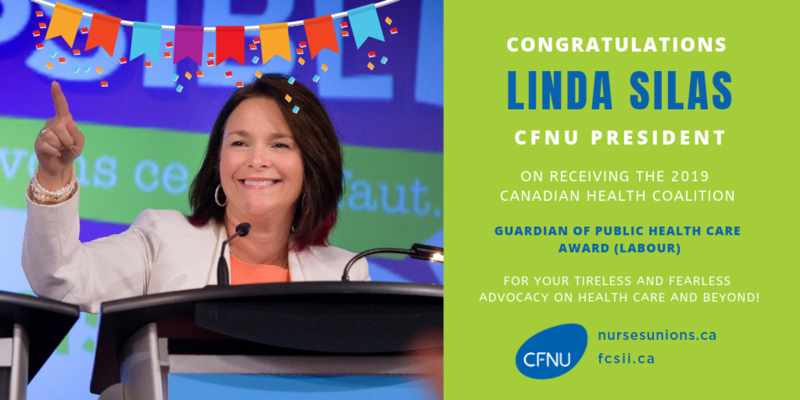 Unions representing more than 200,000 nurses and student nurses across the country are congratulating Linda Silas, President of the Canadian Federation of Nurses Unions (CFNU), for being awarded a prestigious Guardian of Public Health Care Award from the Canadian Health Coalition (CHC). As the CHC celebrated their 40th anniversary in Ottawa on Tuesday, April 2, 2019, they recognized key individuals who have made tremendous contributions to protecting and expanding Canada’s public health care system. Silas was recognized for her decades of service as a nurses’ union leader, championing greater understanding and action on the social determinants of health and key policies to enhance social justice and worker’s rights. In particular, Silas is a long-time advocate for national, universal pharmacare and has campaigned for this program among the public and decision makers at every level. “Linda’s efforts over the years to advance the evidence for pharmacare, driven by her activist commitment to a more just society, helped lay the groundwork for the CLC’s current campaign to win universal prescription benefits for everyone, helping convert the issue from a lofty proposal to a common sense objective,” Hassan Yussuff, President of the Canadian Labour Congress. Silas received the CHC award in the labour union category alongside Martha Jackman and Ian Johnson, recipients in the academic and community categories respectively. Silas has been the President of the 200,000-strong CFNU since 2003 and is the foremost advocate on behalf of nurses in Canada. Linda was previously the President of the New Brunswick Nurses Union (NBNU) for 10 years and is a graduate of l’Université de Moncton, where she earned a Bachelor of Science in Nursing, and has practiced in the ICU, emergency, and labour and delivery. Linda believes health care, like education and decent work, is a human right.